UPDATE 0830 GMT: In an abrupt change of tone after hailing “progress” in talks with North Korea, US Secretary of State Mike Pompeo has fired back at Pyongyang’s jibe of a “gangster-like” Trump Administration. “If those requests were gangster-like, the world is a gangster,” Pompeo said from Tokyo. The US official clung to his declaration that there had been progress in two days of discussions conducted in “good faith” during the meeting. But he told Pyongyang that economic sanctions will be maintained until complete denuclearization is achieved, rejecting North Korea’s phased, reciprocal approach. North Korea lashes out at the “gangster-like” Trump Administration, less than a month after Donald Trump’s summit with North Korean leader Kim Jong-un. Trump declared on June 13, the day after the summit, that North Korea’s nuclear threat was over, but Pyongyang made clear on Saturday that it will not pursue unilateral, complete denuclearization. Commenting after two days of talks with Secretary of State Mike Pompeo in Pyongyang — the first encounter since the summit — an unnamed North Korean official said the discussions were “deeply regrettable” with the Administration’s “unilateral and gangster-like demand for denuclearization”. North Korea’s Foreign Ministry did point to its denunciation as a negotiating tactic, rather than a breakdown of contacts. In particular, the Minister appeared to be trying to split Trump from his advisors with a personal appeal — the statement said that Kim Jong-un still wanted to build on the “friendly relationship and trust” forged with Trump during the June 12 summit in Singapore and that Kim had written a personal letter to Trump, reiterating that trust. During the maneuvering with Trump just before the summit, Pyongyang played to Trump’s ego with a giant letter in a giant envelope. 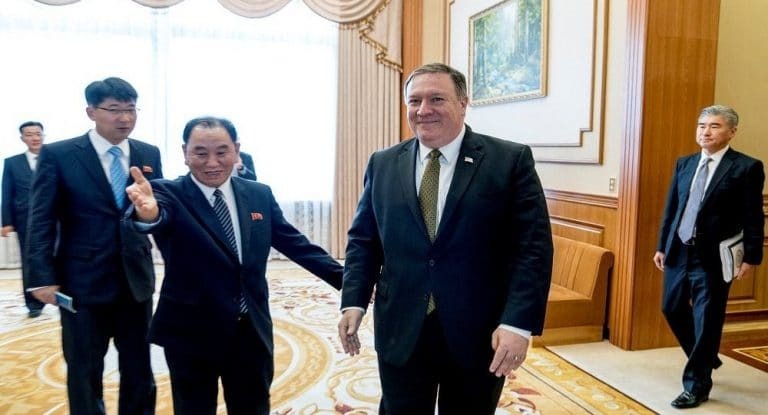 The message was delivered by key advisor and former intelligence Kim Yong-chol — the same official leading talks with Pompeo on Friday and Saturday. But the North Korean line on Saturday highlighted that, contrary to Trump’s sweeping assertion last month, Kim had only given the vaguely-worded “denuclearization of the Korean Peninsula” in the summit’s brief document signed by both men. It also indicated that Trump’s unilateral concession of an end to joint US-South Korean military exercises, made without consulting the American or South Korean militaries, has not been matched by North Korea. Pompeo was vague about the “progress” on “central issues”. He said a Pentagon team will meet North Korean officials on or about July 12 at the border between North and South Korea to discuss the repatriation of remains from the 1950s Korean War. The Secretary of State also said working-level talks will be held about the destruction of North Korea’s missile engine testing facility. The US position has been that North Korea disclose all the details of its nuclear weapons program, dismantle its facilities, and enable verification by inspectors. Pyongyang wants a step-by-step, reciprocal process, including the lifting of economic sanctions and a drawdown of the US military presence on the Korean Peninsula.